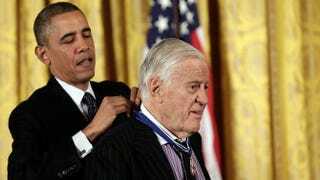 President Barack Obama awarding the Presidential Medal of Freedom to Ben Bradlee, former executive editor of the Washington Post, in November 2013. "To be blunt about it," he wrote in his 1995 autobiography, "A Good Life: Newspapering and Other Adventures," I didn't know anything about blacks, or the black experience, and I was about to become involved in the leadership of the number-one newspaper in a city that was 70 percent black, and a readership that was 25 percent black. I had had no black friends growing up. Five years after the Post rejected goals and timetables, Robert C. Maynard, who had been the Post ombudsman, left the newspaper saying he knew he would never rise to the top job. He later became editor and publisher of the Oakland Tribune and co-founder of what is now the Robert C. Maynard Institute for Journalism Education. Writer Jill Nelson noted Bradlee's interest in the credentials of the privileged in her 1993 book "Volunteer Slavery." Maida Odom wrote then in the Philadelphia Inquirer, "On the day she was interviewed for a writing job at the Washington Post's new magazine in 1986, she recalls, the conversations seemed less about her work and more about her. Ben W. Gilbert, a former Post city editor who worked at the Post from 1941 to 1970, quoted Roger Wilkins, whose Watergate editorials helped win the Post the 1973 Pulitizer Prize for public service, on what Wilkins saw as two versions of the truth.